Locking containers with keys so only you and your friends can have access to them! LockSecurity is an RPG-friendly plugin that gives users the ability to lock their doors, chests or any other container using a key. Locked objects are inaccessible, indestructible and effectively off-limits for anyone without the key that the object was locked with. Want someone else to be able to access your locked blocks? These keys can easily be duplicated, much like a book can in a crafting table, and distributed among friends or anyone to which you wish to grant access. Want to get rid of a key you're not using anymore? Put it in the crafting table and get yourself back a new key you can use to lock another block. On top of being incredibly easy to use, LockSecurity brings a number of configuration options to make this plugin your own. From what blocks are lockable to maximum locks per world to aesthetics and accessibility, the plugin can be configured to meet your expectations. Even messages are configurable through language files. Additionally, administrative tools such as notifications when blocks are locked, ignoring locks upon command, and forcibly unlocking the blocks of others, all with individual permission nodes. LockSecurity comes with a large variety of commands that assist administrators and players alike. Each command has its respective permission node (see Permissions section) and command feedback if unsuccessful. 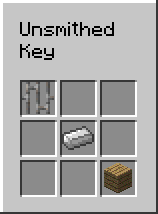 Assuming players do not have access to give themselves infinite unsmithed keys using the /givekey command, a crafting recipe has been added to let players craft keys for themselves. The following recipe is one of eight possible recipes as it is shapeless such that the ingredients are in a straight or diagonal line. It may be rotated in any orientation and an unsmithed key will be crafted. As of LockSecurity 1.5.0, an API was created to allow developers to create add-ons. This API is fully documented and Javadocs may be found here. If you've created an add-on for LockSecurity, feel free to send me a private message with a link to the resource and I'd be more than happy to acknowledge it and contribute if possible. I have created an add-on for LockSecurity to show the true power of the API titled "LS-ChestCollector". Using locked chests, you can create wireless collection systems to collect the items you specify in the command. Upon picking up the specified items, if there is room, items will be automatically transferred into the chest from your inventory. If you're interested in seeing the plugin, it's available on BukkitDev. Source may be found on LockSecurity's GitHub repository. Hibbix, Varni1, niho1212 and 1 other person like this. Great Plugin my good Sir :). Been waiting for this to update to use. Is great for servers all servers and is friendly user use. I'm dying to update this, and it's actually almost done. It's just been sitting on the back-burner due to other projects taking precedence. This will be completed by the end of this summer! It's fine! I know you by the Spigot Development Forum, and you are a good developer. The only thing I would change is the possibility of putting the key inside the chest. On the PlayerInteractEvent make sure he can't put the key into the respective chest so the chest will be always removable. I've been working on a bit of a rewrite for this plugin for a little while. Though I've been quite busy with other tasks to actually complete it. Soon enough I will, and I'll be sure to include this change. Finally nobody can read my secret diaries that I store in chests and judge me, Thank you - 2008Choco! Great plugin, the best of the kind. 100% Customizable, easy to configure and to use. You can integrate it in a shop and adds tons of fun! 2008Choco is a smart and gentle guy. Thanks for your job. Awesome plugin, the dev is really nice, and listen to what you have to say, and correct the bugs, really quick, a great thank you to him. And also this kind of plugins, is almost inexistant, which is great to have this one, updated, and bug fixed. The idea: to add a lockpick with which players could break open the closed chests, doors, etc. Breaking happens only when chest owner playing on the server. Nice function for roleplay game. Glad you enjoy the plugin! Thank you! Great update, thank you so much for him. Not enough bunch of keys, and an alternative method for opening chest without a key. I apologize for any errors, I used the translator. There is a configuration option entitled, "OwnerRequiresKey". If set to false, the owner of the block does not need to open the block with a key. I also plan on creating a configuration option entitled, "RequiresKeyInHand", which if set to false, will only require you to have the key in your inventory. Cool plug, but not enough craft to duplicate keys.Please add this function, it is extremely necessary. It's really funny you mention the duplication of locked keys. I just finished coding this for version 1.4.0 this morning. I plan on releasing it sometime in the next couple of days ^-^ Few more features I wanted to add into this. Today is like, the best day ever. Holy crap. Dude, I've received a video from you and another person on my AlchemicalArrows project. Minecraft Forge's VeinMiner recreated for CraftBukkit and Spigot servers!